Take advantage of this report and claim your free 30 minute phone call with one of our top consultants. Get powerful insights into driving more traffic to your website and converting visitors into customers. The overall grade scale ranges from A+ to F, with most companies known as leaders in their respective industries maintaining around A rating. In addition to viewing the results of the Report on the Spheere website, you can opt to receive their reports in .PDF form by email. The Spheere Website Report .PDF file contains handy colorful charts, ratings, and easy-to-understand result interpretations which help showcase audited websites’ strengths and weaknesses, help website owners gain insights into the steps they need to take in order to boost their business visibility through search engines. Stuck on the second page? Often reason is a lack of quality links pointing to your website. 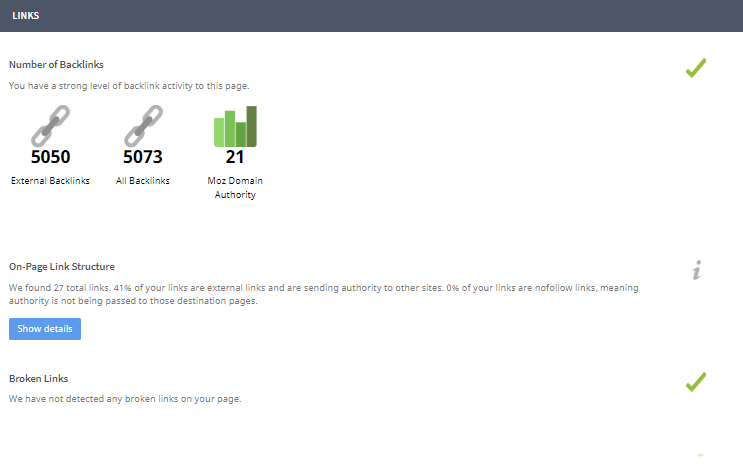 By using our backlink checker you can see your domain authority. With Google algorithms getting smarter every day it is paramount that you pursue organic and quality link building techniques. Machine learning has enabled Google to analyze content much better and give ranking advantage to the most useful and informative content. Google is becoming better in spotting low quality and artificial links. 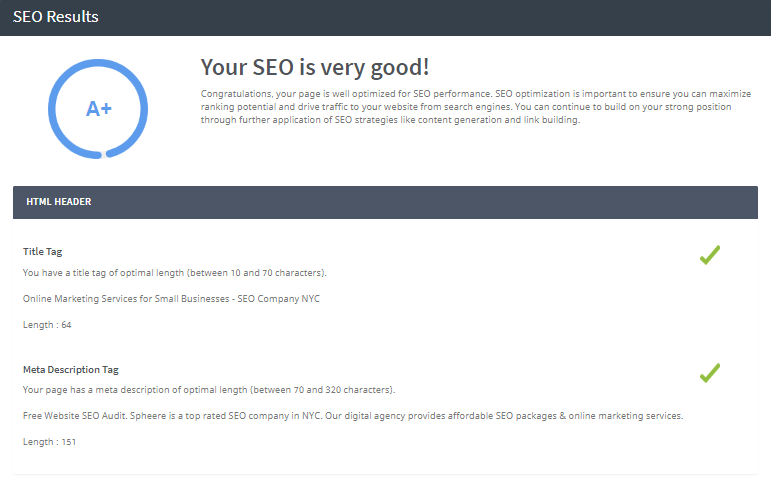 Try to offer useful content, this will help you gain backlinks naturally as high authority websites will be able to utilize your information and link out to you in some cases. It's also not a bad idea to have some links in your content leading to authority pages. Authority pages are merely pages you cited in your content. This means users can get more content in-depth content by clicking those links. Outbound links help increase the relevance of your content and send proper signals to search engines. Nonetheless, too many outbound links will produce a result you do not know what you want. Inbound links refer to websites that link to your page. This indicates authenticity to search engines which is a good thing, especially if these websites linking to your site are popular. Test your website speed and get important insights into your it's overall health and search engine indexability. Optimizing the size of your images will directly improve the load time of your page. When images are compressed in a way that still keeps their quality, you maximize the full benefits of using photos without negatively impacting your page's SEO. Using caching plugins is another way of improving page's speed. Caching plugins help visitors keep essential components of your site so that it loads faster when they visit next, increasing the load speed many times. Reducing the number of redirects. The more the redirects to other pages, the lesser the speed of getting to the destination website. 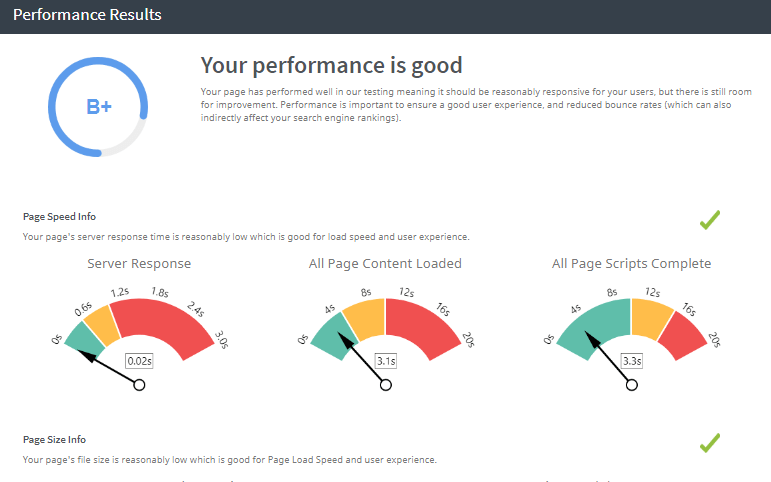 Our free tool offers a detailed insight into any website's server response time, page size and script minification levels. Once a report is generated you are going to get easy to understand instructions and suggestions. You can implement these changes yourself if you know a little bit about web development. See if your website is up to date with the latest standards and if it is protected against hacker attacks. See if you have any viruses by scanning your website for malware or how well your site is protected by measuring security levels. 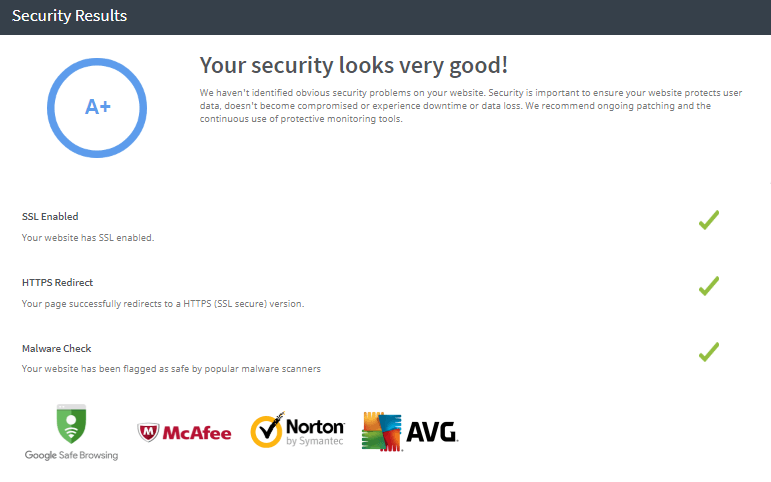 Use our website vulnerability scanner for advanced breach prevention. Test your SSL settings, Google gives encrypted sites a big advantage when it comes to rankings, especially in the voice search results. Implementing security features makes your site look trustworthy to search engines. Features like an SSL certificate, improve the way both search engines and humans alike view your website. Including some security plugins can also be useful. Above you can see the security level report for spheere.net. Copyright © 2019 Spheere Inc. All Rights Reserved.